Home / Internazionale / Giornata d’Azione Europea dei lavoratori di Caterpillar. Sit-in a Ginevra! Centinaia di rappresentanti dei lavoratori di Caterpillar e dei sindacati, provenienti da Belgio, Francia, Germania, Italia e Regno Unito, hanno manifestato oggi a Ginevra (davanti la sede del Gruppo multinazionale) contro i piani di ristrutturazione aziendale. 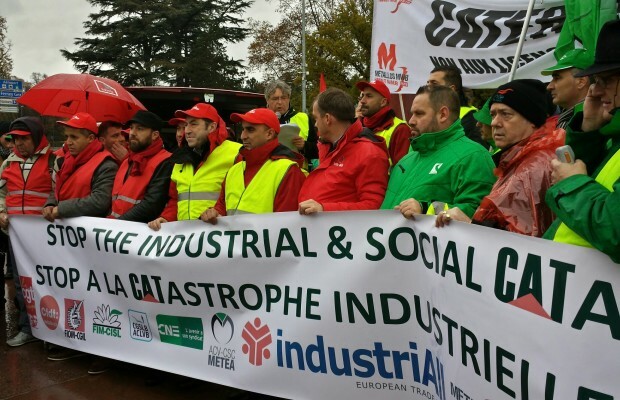 L’azione di lotta, alla quale ha partecipato – in solidarieta’ con i lavoratori del Gruppo – anche il segretario generale di IndustriALL Global Union, Valter Sanches e’ stato un forte messaggio al management di Caterpillar che, per la prima volta, si confronta con una mobilitazione sindacale a livello europeo. Di seguito il comunicato stampa in inglese di industriAll Europe e il link del volantino distribuito tra i lavoratori del Gruppo (flyer-euactionday_cat-updated-en). 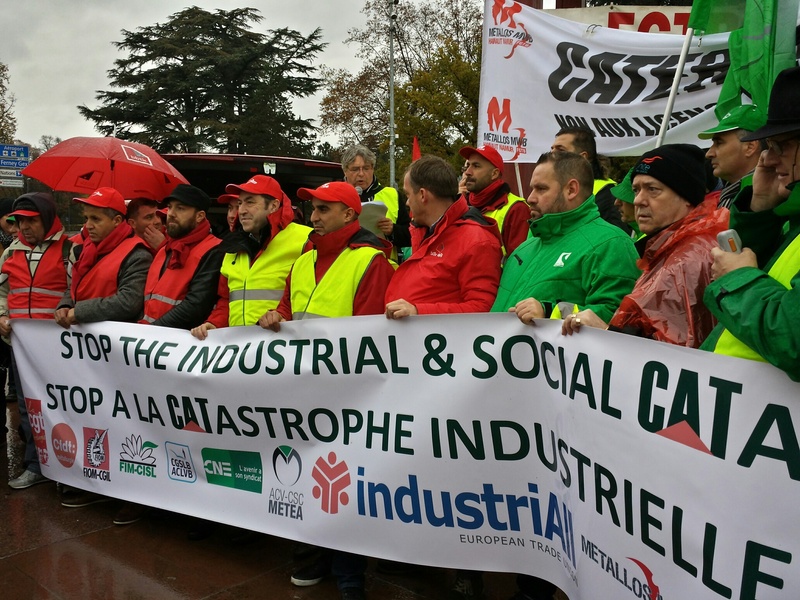 Caterpillar: European workers, taking action in Geneva, say Stop the social and industrial CATastrophe! Today, 18 November 2016, hundreds of Caterpillar workers from numerous European countries convened in Geneva, at the company’s European headquarters, to protest vehemently against the plans to close plants and cut jobs. Heeding the call of their trade unions and united under the auspices of industriAll Europe, workers from Belgium, the United Kingdom, France, Italy, and Germany made their voices heard by the management of the multinational company, who had never been confronted with a transnational demonstration before. This European trade union demonstration is, in fact, the first in the history of Caterpillar! It reflects the scale of the shock caused by the announcements of restructuring which will threaten 2,500 direct jobs in Belgium (at the Gosselies site) and in Northern Ireland (Monkstown site), as well as thousands of indirect jobs throughout the European value chain. Due to a lack of transparency and information surrounding the global strategy of the company, it was impossible to predict these announcements. Furthermore, they do not reflect the conscious efforts made by employees over the last few years to improve competitiveness. In reality, these plans lack a sound industrial basis and are guided by a financial strategy focused on the short-term expectations of shareholders. Today’s demonstration is a continuation of a number of other actions organised over the last few weeks by trade unions and workers from various sites across Europe. Their concerns are also widely shared by the local and European communities, who have also taken up the issue. Decisions made by Caterpillar are gambling with the social and industrial future of entire economic areas. In reaction to this, public authorities have taken urgent measures to set up a ‘Caterpillar Task Force’ in Belgium (see here) and at European level (see here). The views expressed by the European Parliament, in its resolution passed with a resounding majority last October, are a further condemnation of Caterpillar’s strategy and the absence of a socially responsible approach to managing such changes. “The high turnout today is a direct reflection of the level of concern, due to the fact that these entire regions, already victims of de-industrialisation, are now being affected by Caterpillar’s decisions”, stressed Sylvain Lefebvre. “The company’s management has to take responsibility and accept a discussion on alternative solutions which would allow for sustainable and socially responsible economic development. Furthermore, it is high time that European decision-makers learn from these restructuring experiences in order to finally realise the urgent need to create an ambitious re-industrialisation strategy for Europe”. Follow the action and the messages of solidarity from around the world on Twitter (#EUActionDay_CAT), Facebook, and FlickR.